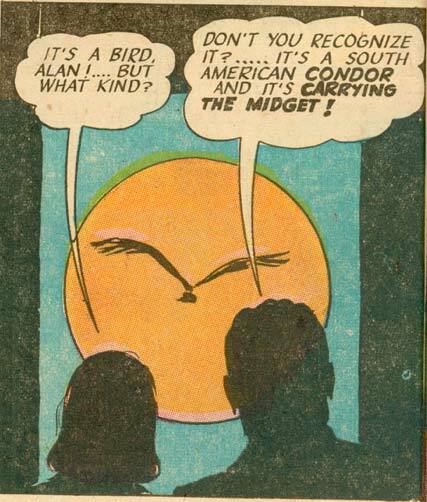 Random Panel: Quick, to the Ornithologist Signal! 10 Responses to Random Panel: Quick, to the Ornithologist Signal! He could grip it by the HUSK! “Your Orinthology is spot on, but your political correctness leaves something to be desired”. Yet more historical evidence that once upon a time in America the people were more relaxed and didn’t have to crap their pants silly trying to remember what the latest term is to be P.C. RitoruBushi, wait til you see that the midget in question is a Japanese agent named — and no, I am not making this up — “Squat-So”. I bet he could even recognize a gorilla by its shadow! Oh, and if you squint really hard, the moon looks like a Japanese face with angry, furry eyebrows and little squinty slant eyes. Now that’s PC. What is the maximum velocity of a South American condor? Ah, so that’s where they come from.